"On the planet Cicero Prime, the kingdom of Cardenas is divided, with the whole population forced to swear allegiance to either the effete Duke or the fiery, hard-edged Duchess. This is a situation both parties have grown tired of. What use is half a kingdom when, thanks to a carefully engineered murder, you could have it all? Surely, neither of them would be rash enough to summon the deadly off-world assassin The Scorpion to help with their problem? And surely, this terrifying figure wouldn’t arrive wearing a long cream coat and striped trousers…?" 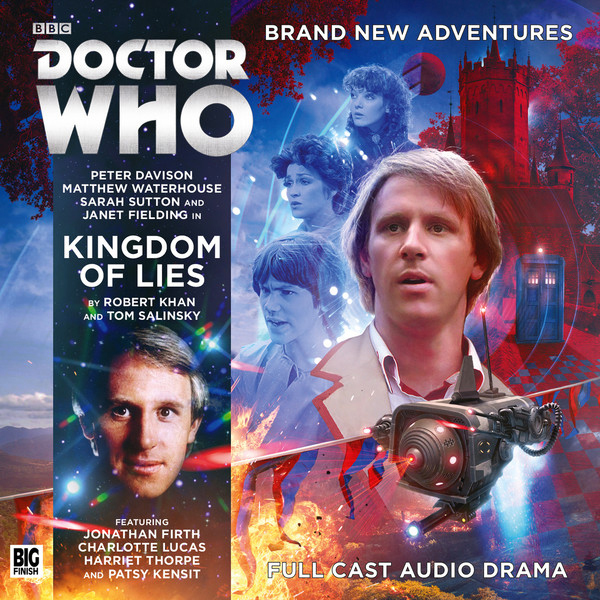 The 2018 main range of Doctor Who plays kicks off the year with Kingdom of Lies; an outing for the Fifth Doctor, Adric, Nyssa and Tegan. 2017 started the year running with this team with The Star Men, but will lightning strike twice? Frankly, yes. Set in the pseudo-medieval kingdom of Cardenas, the Doctor and his friends land after a timely intervention in the TARDIS from Tegan (when it doubt, whack it and see what happens) and soon find themselves embroiled in a tangled web of assassination, marital troubles, and assumed identities. It doesn't take long for this story to set out its credentials as a comedy and Nyssa in particular benefits well here. One minute she's simply Nyssa of Traken, the next she's the apparent assistant to the Scorpion, feared assassin and mercenary for hire. Sarah Sutton has a lot of fun with the material, and Barnaby Edwards milks it for every drop of comic potential, giving us a masterclass in how to handle this sort of material. Robert Khan and Tom Salinsky's first Big Finish outing, The Ravelli Conspiracy, was a bit hit-and-miss, with the actors seemingly uncertain at times in their faith in the material, as evidenced in the extras where Peter Purves and Maureen O'Brien confessed they were not too sure about the script before recording it. You get the impression that wasn't the case this time around as everyone commits to the comedy with full gusto. Matthew Waterhouse is an especial revelation in this case, and I wish we'd had a bit more of Adric in here. Janet Fielding, meanwhile, observes that Tegan takes a bit of a backseat here this time. It's a pity for certain, as the relatively recent Time in Office (my favourite main range release in 2017 by far) shows just how compatible Fielding and Tegan are with comedy. The test of any comedy really is twofold: will it stand up to repeated plays (untested, but I suspect there's enough going on here to let that be the case) and does it remain entertaining for the duration? Thankfully, Khan and Salinsky realize that having four episodes of comedy on the trot may well test listeners' patience and wear the story's premise thin, so the final episode shifts gears to become a chase of sorts where death is a very real possibility and things feel a lot more dangerous than the lighter tone before then would have you necessarily expect. It's a smart move. I've mentioned the regular cast, but praise must also go to the guest cast here. Patsy Kensit is clearly enjoying herself, for example. I'd quite forgotten she was in it, but the second she started speaking I found myself unable to shift the song I'm Not Scared from my head: I swear her voice hasn't aged a day since she sang that. Elsewhere, Charlotte Lucas is superb as Miranda. Selfish, rude and egotistical, she is that rare hated character where you boo her not because she is inherently evil, but because she is thoroughly dislikable. She's the sort of person you'd go out of your way to avoid in the workplace, knowing she would find fault in everyone else's attitudes bar her own. Humour is subjective of course and your mileage will vary, but for my money this is a very bold and genuinely amusing start to the year's Big Finish offerings and all praise must go to the writers, the cast (both regular and guest) and Edwards' direction. I'm fairly hesitant to give anything full marks, especially when the impact of something like this is very much weighted on the first listen. Comedies are rarely as fun the second time around; horror films lack the initial impact; thrillers are devoid of some of their thrill once the twists are there. I'm going to make an exception here though. This one's very fun indeed. + ORDER this CD via Amazon.co.uk!